Calling the entrance to ALEX in the Wynn dramatic is like calling Hamlet a family drama. It is one of the most stunning restaurant entrances you will ever see, and the walk down the sweeping, curved staircase puts one in mind of making an announced entrance into the first class dining salon on a grand ocean liner of days gone by. All that’s missing are the flowing gowns and tuxedos. Sadly, these days you’re more likely to see golf shirts and mini-skirts (that rarely flatter the people who wear them). That creeping California casualness does injustice to Alessandro “Alex” Stratta’s food (and Paolo Barbieri’s wines), but thankfully, both are so good — the play’s the thing* after all — you won’t be looking at all that sartorial blight once the food starts showing up. And brevity may be the soul of wit,* but it doesn’t necessarily work for restaurant reviews — especially those that wish to rhapsodize over Stratta’s always-excellent amuses bouche. Brightness and intensity have always been the watchwords of his style, and no where is that more in evidence than in the four small bites that are put before you at the beginning of a meal. Sparkling tuna tartar is given a sprightly kick from a piment d’espelette aioli; a veal sweetbread arancini balances the crisp, the soft and the rich beautifully, and the tiny sip you get of a barely foamy scallop soup with lemon oil will have you moaning for more. Speaking of moaning, the butter poached Maine lobster with chanterelles and coral butter was so unctuous and over-the-top with lobster richness, that after two bites we thought it might be the best thing we’ve ever had here…that is until we tried Stratta’s and Chef de Cuisine Devin Hashimoto’s lobster Newberg during Restaurant Week. Both dishes demonstrated how great chefs (and great recipes) work, as both had intense lobster-ness, appropriately gussied up with just enough folderol (a puff pastry with spinach for the Newberg, a corn custard and chanterelles for the poached crustacean) and sauces to provide pleasant distractions, but still keep you focused on the main event. It was originally named Lobster a la Wenberg at Delmonico’s restaurant in NYC around 1876 after a certain Ben Wenberg (a sea captain) who demonstrated the recipe for the Delmonico brothers and Charles Ranhofer — America’s first “celebrity” chef. After an unknown dispute between patron and owner (too much salt in the brisket? not enough courtesans in the private rooms? behaving like ELV on a bad day? ), Wenberg was banished from Delmonico’s, but the menu item proved so popular, the Delmonicos created an anagram of his name, and launched the dish into history. Stratta’s take on this classic was appropriately atop a classic puff pastry, with a Madeira sauce giving the whole presentation a nice, sweet-but-not-too-sweet old-fashioned flavor. There was nothing modest about the portion, but we could’ve eaten two of them. You expect food of this caliber to be of the highest quality and properly seasoned, and by and large it is. The only flaws we’ve ever found in Stratta’s food is the somewhat pedestrian presentations that come to the table. We contemplated this as a too-large (but moist and flavorful), filet of ocean trout perched atop cranberry beans with charred cuttlefish, appeared before us, surrounded by sauce. All four parts of the dish harmonized, although nothing about the look of it was compelling. Hamlet may have bemoaned: “More matter, less art.”* but we’d like to see a bit more of the latter in dishes like the trout, and for an otherwise impeccable piece of moi, stacked (once again) atop a rice cake, placed in a puddle of sauce (in this case, a finely-tuned ginger aioli). A picayune quibble you say? Possibly, but at a Michelin two-star, with a chef of Stratta’s unimpeachable reputation, we expect better window dressing. We consider Stratta to be one of the enduring gems of Las Vegas dining (he was KNPR’s Chef of the Year in 2005), but he (and just about every other chef in the land) is too fond of sous vide cooking. 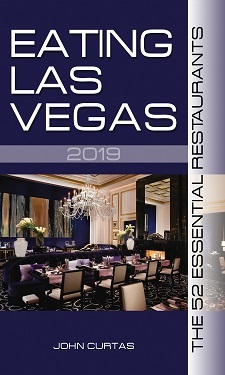 Eating Las Vegas considers it an overused shortcut that every chef in America has taken to heart ever since Thomas Keller said it was okay to do so. Here you can experience this vacuum-pack technique (just like Stouffer’s, only tastier), in his medallions of octopus — so tender that you’d never know they were the “tako” of Japanese sashimi fame. It’s also present in the ultra-rich, 72 hour vacuum-sealed, slow-cooked American wagyu short ribs, that demonstrate why chefs love this technique so (intensification of flavor caused by stewing in its own juices). For our money though, what vacuum-cooked food gains in locked-in taste, it loses in texture (invariably mushy). Plus, we don’t like the way sous-vide alters the natural process of heat and moisture exchange inherent in all cooking. Stratta has debated us on this point before, and at this point we’ve agreed to disagree. We also recently debated the relative merits of tuber melanosporum with him in his restaurant (in case you haven’t guessed, he’s a super guy to kibbitz — and sniff truffles — with) — Stratta claiming the variety he gets from Australia is of sufficient intensity to challenge the classic black Perigordian truffles of France — us thinking they may be the same genus, but lack the oompf that gives the European variety its reputation. Regardless, his murder most fowl* — roasted squab with grilled duck foie gras atones for all sins — small bites of the small bird playing off the silky richness of the liver. The only flaw with the dish being the corn puree and itty bitty turnips didn’t provide enough of an acidic counterpoint to the sumptuousness of the poultry. Rest, rest perturbed spirit,* in good time, but first a word or two(?) about the wine list. All we can say when we look at it is: Though this be madness, yet there is a method in it. * Put another way, what Master Sommelier and uber-wine guy Paolo Barbieri has compiled is a trophy list, that is not for the faint of heart. The best way to approach it is preferably with the wallet of someone not related to you. Barring that, the by the glass selection works very well with the menu, and Barbieri’s own wines — Colson Canyon and Kylix Santa Barbara syrahs — are some of the few bottles under a hundred bucks, and go great with everything but the most delicate seafood dishes. As for the method in that mad list, the truth of the matter is these big casino lists exist solely for the high rollers. And by “high rollers” we’re not talking about your average upper-middle class, all flash with some cash, let’s-blow-a-wad-livin’-large Vegas conventioneer. No, we’re talking about the true comp-consumed gambler who plays a non-stop cat and mouse game with their gambling dollars at these premium joints. Thus do the wine directors at these high-rollin’ joints price their wines at exaggerated markups so the only folks that can really afford them (those cashing in their casino comps) will use up said comps as quickly as possible. Half the time, these philistines don’t even know what they’re drinking, but when they point to a $200 (or $2,000) bottle on the list, those comps are disappearing all the quicker. 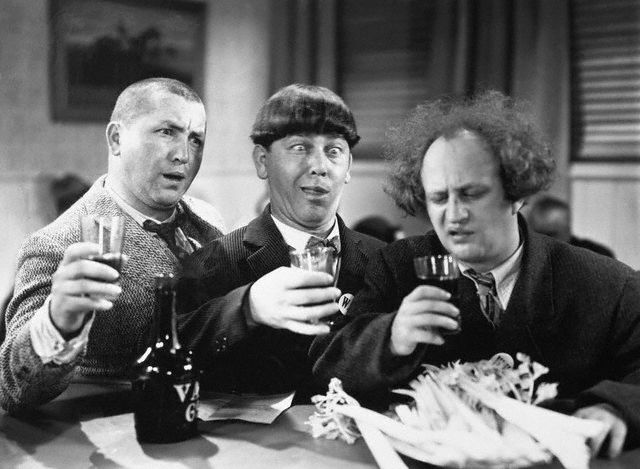 ELV and his staff are hardly CPA’s, and we don’t know how the hotels square these accounts with the IRS, but it’s pretty obvious that by outrageously pricing wine, the comp players drinking them are depleting their accounts more rapidly — which is just what the guys in the green-eye shades want them to do. What the casinos have done is create an artificial exchange rate for this product. All of this is to the detriment of true wine lovers who don’t feel like paying (with their own money) two hundred bucks for a fifty-dollar bottle. Once you realize these lists aren’t for wine drinking, they’re for showing off and soaking up comp dollars, it all makes more sense. We wish we could say the same about Jenifer Fournier’s desserts, but we’ve always found them technically unassailable and tasty, but uninspired. On this we must be cruel to be kind,* since her work displays neither the avant-garde craziness of Vannessa Garcia, nor the pristine quality of Sarah Kosikowski‘s oeuvre, nor the famous French flourishes of Kamel Guechida, Frederic Robert or Gregory Gorreau. You will enjoy them, but you won’t remember them. Doth ELV protest too much? * We think not, but do think a restaurant of ALEX’s caliber deserves the full Monty. It is sui generis. A cathedral of a restaurant, serving immaculate food amidst spectacular architecture with which only a few places in the world can compete. In its own way, it is a monument to all that Vegas has accomplished on the world dining scene. If the question should ever be put to you (or you should ask yourself): To be or not to be? * (at ALEX), your answer should be a lot easier and more unequivocal than Hamlet’s ever was. ELV has eaten two meals here recently and didn’t pay for either of them. He did, however, leave a $100 tip each time. In the past four years he’s dined here on at least four occasions and paid substantial sums from his own pocket for the privilege. Wow… bargained for a Alex review, got a wine retailing treatise and Shakespeare refresher in the balance! That’s a good question. Last time I visited the family in Orange County, I remembered wine prices at the restaurants there being a little lower than here, but not by very much. I double-checked today at some web sites (the ones that post their wine lists online), and my memories were confirmed. I can’t speak for New York, but it seems compared to Southern California a good French or Italian wine bottle will “only” cost you about $20-50 more per bottle. I would have to agree with your assessment, including that of the desserts. Unfortunately they don’t live up to the dining experience. I’ve noticed that on each of my last three visits. First visit to your site but i’m taking an immediate liking to it! As far as my one experience at ALEX can inform me, I believe all your praises are well-deserved, and some of your criticism is too. Expensive wine comes with the territory in any 2+ star both here and in France, and i was almost surprised to find bottles starting at $89. And what a collection! The sauternes list was somptuous, to name only this one, plenty of small regions were represented (except sadly, monbazillac), and i gorged my eyes so much on this list that I didn’t need to spend any money on wine to be already satisfied. The dessert (3 too-dry quarters of a peach resting on a delicious frangipane-based génoise), sadly, was sub-par; yet the migniardises both before and after were very enjoyable… and the best madeleines ever! Other than that, the whole rest of the experience was maybe lacking a bit of craziness at times but pretty flawless in its pairing of tastes and textures, especially in the amuse-bouches. One glaring exception, the scallop ‘appetizer’, was prepared to perfection but with way too salty a sauce to my taste. If Shakespeare came back to life and attended one of his plays, he’d look at the audience gritting their teeth while not understanding a word of his play all the while repeating maniacally to themselves: “I am cultured. I am cultured, goddamnit,” and he’d say, “Why don’t you fools translate this into modern English so that people can enjoy it. Doth speak the phony professor: “Oh, the poetry; the poetry will be compromised.” Nonsense. Sadly, those that want to enjoy Alex are running out of time; the restaurant will close this month, and the space will be converted into a “special events center”. No news going forward as to what it means for a super Chef, except that “Stratta” will remain open.